Öffnungszeiten der Ausstellung: Sonntag 27.9.2019, 12:00 – 20:00/ Der Eintritt ist frei. 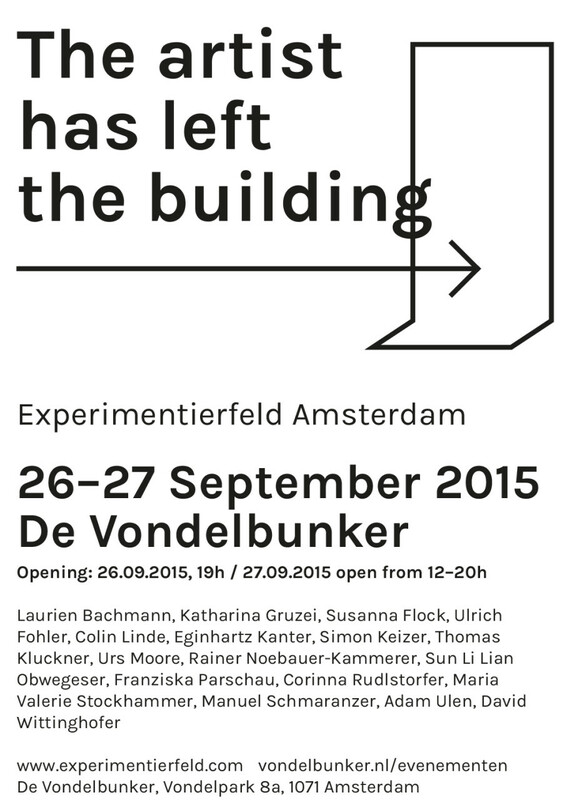 Within the exhibition “THE ARTIST HAS LEFT THE BUILDING – Experimentierfeld Amsterdam” artists from Austria and the Netherlands are presenting projects that have been developed during a short time residency in Amsterdam from the 19-26th of September. EXPERIMENTIERFELD is a residency series with a focus on public space that invites artists to work site specific. It already took place in five european cities and is now hosted by De Vondelbunker. Experimentierfeld focusses on exchanging and connecting artists as much as networking with local art- and cultural institutions. The Project series explicitly encourages and supports the realisation of new artworks that deal with public space or site specific aspects.